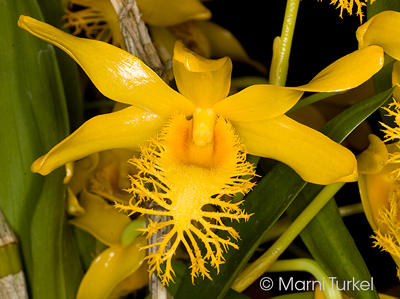 Dendrobium brymerianum outcross #404 ('CH' x 'TC') (approximately 25 seedlings per flask). 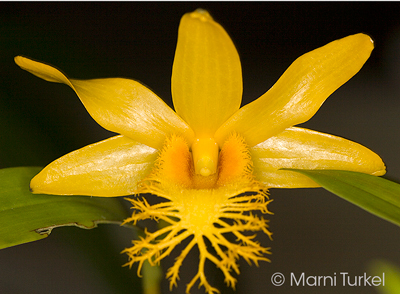 The Species: This grows in Southeast Asia and China and is usually found at elevations of 4600 to 5300 feet. 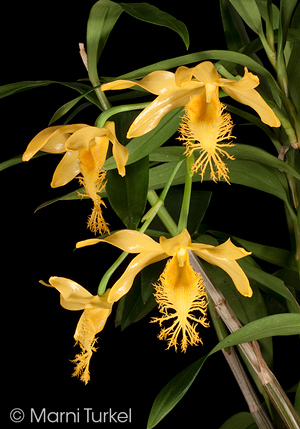 It is an epiphyte and has an upright growth habit. Summer monsoon rains are heavy, the humidity is high and the skies overcast. In the winter, there is little rain, skies a clear and bright. The flowers are produced on older canes which will produce flowers for several years. The deeply fringed lip is very distinctive and the flowers have a fragrance that reminds me of bees wax. The 2 to 3" flowers last several weeks. Both of the parents used for this outcross open fully and do not self-pollinate the way many Den brymerianum clones do. Culture: I have always grown this species potted (either plastic pot or in a basket) in intermediate to cool conditions. The summers are warm, shady with a lot of water and regular fertilizer. Winters are brighter, a bit cooler, and drier. "Water to prevent severe shriveling during the winte" is a phrase often used to describe the winter dry rest. I have found that it does best for me with an occassional watering rather than a severe dry rest. As new growth begins, increase water and fertilizer.